Tecun Uman, Guatemala – Zulma Rodriguez sat in the shade of a tree outside the Guatemalan immigration office, waiting on some paperwork before she can cross the bridge into Mexico with her kids. They are the reason she fled El Salvador. “I was forced to leave,” she told Al Jazeera, surrounded by young children, including her six-year-old daughter and 11-year-old son. Rodriguez’s son was in fifth grade in Ilopango, just a few miles east of the capital, San Salvador. Rodriguez worked in a textile factory to support her kids, but could not protect them at school. “And amphetamines,” her son chimed in. Rodriguez’s son loves school and was getting good grades, but gang members were pressuring him to join. Saying no is only an option for so long. “If you refuse [to join], they say they will kill you,” Rodriguez said. In dispersed groups large and small, they quickly crossed Guatemala with a mix of bus rides, walking and hitchhiking. 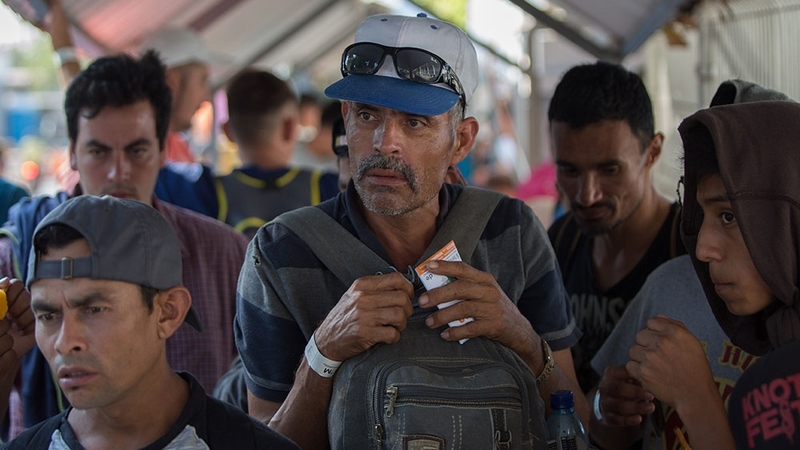 The vast majority of people participating in the current collective Central American exodus are Honduran, but there are many Salvadorans, and some Guatemalans and Nicaraguans have joined along the way. As of Thursday night, 969 Central Americans had registered with Mexican immigration officials, who say the visa processing period will only take up to five days. Hundreds more people were already lined up on the bridge Friday morning, receiving temporary wristbands for identification during processing, and waiting as the lines slowly advanced towards the Mexican immigration office. Thousands of Central Americans fled in a mass exodus in October and November, when more than 10,000 migrants and refugees made it into Mexico despite a much more closed door policy. Some 3,000 registered with officials for refugee status consideration, but the majority entered without processing following tense stand-offs at the border, where on one occasion Mexican federal police deployed tear gas and anti-barrier projectiles, killing one Honduran. 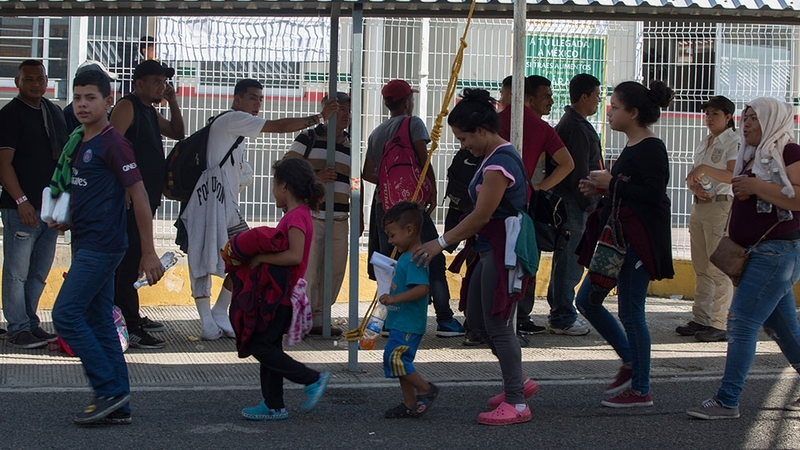 More than 6,000 Central Americans made it to Tijuana at the US border late last year, and some remain, while others have returned home or crossed into the US to request asylum both at and between official points of entry. Rodriguez left El Salvador as part of last year’s exodus, but she did not make it up to Mexico. Early into the journey, she and her kids met a Honduran mother also travelling with young children and they decided to stay in Guatemala as a group and try to start a life there, but soon ran into difficulties. “In Guatemala we could not register our kids for school,” Rodriguez said. For now, the families have no plans to go to the US. They hope to find work in Mexico and enroll their kids in school. “My goal is for my children to study. That is my top priority as a mother,” Rodriguez said. For years, Mexico has cooperated with the US in stopping the northbound advance of migrants and refugees. Mexico deports more Central Americans than the US. Between that long-standing practice and Mexico’s crackdown on last year’s caravans at the border, Central Americans have reason to be wary. Before dawn Friday, hundreds of migrants and refugees decided to not wait around. They crossed the bridge without processing and entered Mexico on foot, walking up to Tapachula, where they began to arrive Friday afternoon. Police escorted the group and are expected to stop their advance unless they are processed for entry. Cesar Medina has no reason to mistrust the Mexican government’s promises of humanitarian visas. The 21-year-old has been through the process before, when he took part early last year in a Honduran migrant and refugee caravan whose participants received the visas. “I was working in Tijuana. I had my Mexican papers,” he told Al Jazeera. Late last year, though, one of Medina’s relatives was dying, and he had to return home to Roatan, an island off the Caribbean coast of Honduras. But due to violence and a lack of employment opportunities, Medina fled the country again this week. “The crisis is greater than ever,” he said. Douglas Iritano left for similar reasons, but home for Iritano is in Mixco, just west of Guatemala City. The 43-year-old worked for years painting houses, but gang violence and corruption in Guatemala pushed him to leave. He tried to leave years ago, but was sent back. “I’m returning to Mexico to take advantage of the humanitarian visa that will allow us to travel throughout Mexico,” he told Al Jazeera, waiting in line to begin the visa application process while a nearby Mexican immigration official hands out sandwiches. “Guatemala faces many pressing challenges including gang violence, drug trafficking, and nutrition. The current government has done nothing to fix these problems because they have been so focused on protecting themselves and their cronies from criminal prosecution,” Representative Torres said in a statement to Al Jazeera in late December. “Sadly, many Guatemalans are giving up hope that conditions will ever improve,” Torres said. Iritano sees migrating as the means of supporting his mother, wife, children, and grandchildren. He migrated to the United States, but was deported in 2006. Following the recent caravans, he attempted to head north again, but was deported. Iritano arrived to apply for the humanitarian visa Friday morning. But the long wait does not bother him, even if he has to sleep outside and only eat once a day for a while. Next articleCan The 2019 Oscars Be Saved?